AFP Dhaka photographer Munir uz Zaman has been honoured at an Asian media awards ceremony for a "heart-wrenching" series of images of penniless Rohingya refugees striving in vain to flee communal bloodshed in Myanmar. The 34-year-old Bangladeshi national received joint first prize in the feature photojournalism category at the 17th annual Human Rights Press Awards, held jointly by the Hong Kong Journalists Association and Foreign Correspondents' Club, and the Hong Kong chapter of Amnesty International. 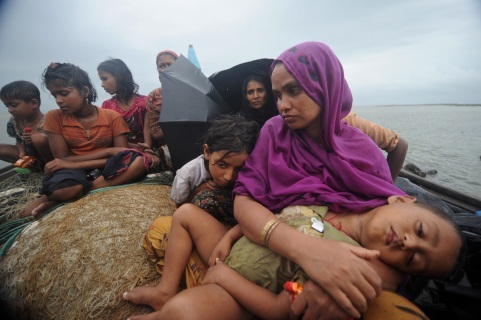 Taken in mid-June 2012, the pictures show Muslim Rohingya people cheek by jowl in rickety boats as they try to take refuge in Bangladesh after violent unrest swept through their communities in Buddhist-majority Myanmar. Carsten Schael, a Hong Kong-based freelance photographer who chaired the judging panel, said the award-winning pictures conveyed the "pure despair of these people, exposed to danger as they sit huddled in the boats". "The images really tell the story of the desperate situation of these refugees. We found them heart-wrenching," he said. Festering tensions in western Myanmar between mostly Buddhist ethnic Rakhines and Muslim Rohingya exploded in early June 2012 with a wave of arson attacks and mob killings that saw tens of thousands flee their homes. Despite US-led appeals to open its border, Bangladesh refused entry to the Rohingya people and deployed patrol boats to turn back hundreds of refugees. Two of Munir's photos were highlighted at the awards ceremony held in Hong Kong -- one of a Rohingya man sobbing as he is manhandled by a Bangladeshi border guard, and another taken close up of a mother cradling her infant in a crowded boat. AFP's Asia-Pacific photo chief, Pedro Ugarte, paid tribute to the quality of Munir's work, which he said underlined the news agency's commitment to "getting out in the field to tell the story in full". AFP is a global news agency delivering fast, accurate, in-depth coverage of the events shaping our world from wars and conflicts to politics, sports, entertainment and the latest breakthroughs in health, science and technology. With 2,260 journalists spread across almost every country, AFP covers the world 24 hours a day in six languages. AFP delivers the news in video, text, photos, multimedia and graphics to a wide range of customers including newspapers and magazines, radio and TV channels, web sites and portals, mobile operators, corporate clients as well as public institutions.